The perpetrator, who was wearing a suit and a tie, shouted ‘Allahu Akbar’ (‘God is great’ in Arabic) during the attack, AP reports, citing their own photographer. The attacker also said several words in Russian, according to the news agency, and damaged several of the photos at the expo. The attacker has been killed by Turkish Special Forces, Turkish Anadolu news agency reports. 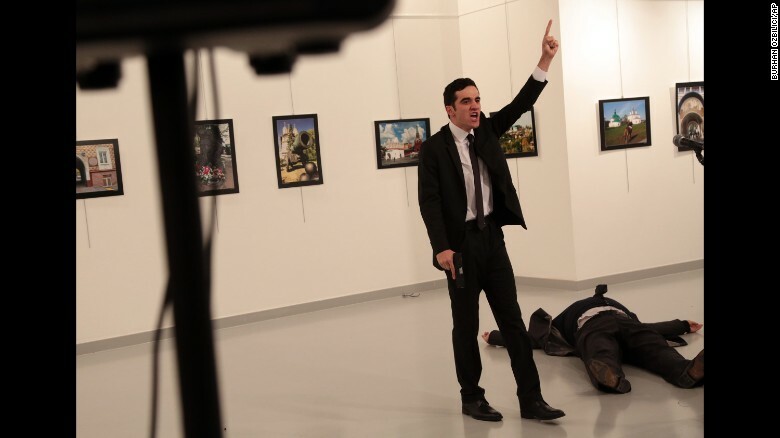 Russian Interfax, citing a source in the Turkish military, also confirms that the gunman was neutralized. Hurriyet newspaper, citing their own reporter, says that the perpetrator also fired warning shots in the air before targeting Karlov. The attacker reportedly identified himself as a police officer as he entered the exhibition, a Turkish military source told Interfax. “We have information, from one of the witnesses, that the attacker presented himself as a police officer, showing the relevant ID at the entrance. This information is being checked right now,” the source is quoted as saying.